We are delighted to announce that applications are now open for the September 2019 intake. The iMBA team is now ready accept your application for the Fall 2019 and answer to all your inquires. If you are interested in an early submission, please make sure you don’t miss the first round of applications, by applying before the end of February. In any other case our application process will remain active until the end of May. The MBA International of the Athens University of Economics and Business is a world-class program tailored to provide high quality and timely business education in today’s global, dynamically changing, and technology-driven business environment. The Program is accredited by the Association of MBAs (AMBA) since 2005 and is offered exclusively in English. A rich, constantly evolving academic program allows students to customize the curriculum to fit their personal and professional needs and interests, while a number of extracurricular activities help them adopt an international perspective, strengthen their interpersonal, managerial and leadership skills, and cultivate their entrepreneurial capabilities. The program attracts students from more than 20 countries and for many years occupies top positions in international rankings. Committed to stimulate extroversion and innovation, the MBA International’s mission is to educate visionary, confident and respectful leaders through a transformational learning experience of highest international standard that bridges academia, business and society. The Program operates in accordance with the Regulation of Postgraduate Programs (Bulletin B’ of the Greek Government Gazette No. 3785/3-9-2018) and Law 4485/2017. The MBA International offers a 14 months long Full Time Program and a 27 months long Part Time Program. Places are subject both to an upper and lower limit of participants, based on accreditation criteria and the regulations of postgraduate programs. Register and login to the link above. Find in the list of available Postgraduate Programs, the MBA International. Select the Full Time or Part Time Program. Select and complete the form in English language. Make sure to double check that the English language form is used. Complete all required fields in the application form. Notice: you should complete the online application and click “Submit”. You will not have to upload any documents. If any personal data is not applicable please type “-“. After submitting the online form and before the application deadline, applicants have to send by post or submit in person to the Secretariat’s office the signed printed form of the electronic application along with the required supporting documents. 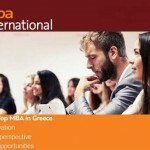 MBA International, Room 805, 8th floor, 47A Evelpidon and 33 Lefkados Street, 11362, Athens, Greece. The secretariat of the Program operates Monday to Friday: 09:00-17:00. Completed Application form (printed and signed). Copies of all University Degrees/Diplomas. For non Greek degrees a recognition by the Hellenic National Academic Recognition Information Centre –DOATAP- is required. Official Transcripts (certified copy of English translation in case the transcripts are not in English or Greek). Certificate of English language: Cambridge or Michigan Proficiency/TOEFL/IELTS. GMAT (obligatory for the Full Time Program). Proof of full employment record. Admission requires minimum three years working experience. Military Discharge Papers (if applicable). Submission of an application for this call does not imply any acceptance.